DNS Setup for Rackspace Cloud Sites to Cloud Server Migration is One of the Dangerous Point to Easily Get Lost. Here are Some Tips. We already discussed the server related technical parts in the Rackspace Cloud Sites to Cloud Server Migration Guide. DNS Setup for Rackspace Cloud Sites to Cloud Server Migration is very dangerous if you do not know what are the risks and take precaution beforehand. Have not we said that, it is mandatory to delete your own data from any Cloud Computing Platform before you leave it? But, here is some important points to note in the steps of how we will delete and proceed properly. Otherwise for unmanaged server, you will end up with Paying for Cloud Sites and Managed Cloud Server. Actually, when Rackspace launched OpenStack, they introduced the Cloud DNS. Older sites DNS related data were copied in a scripted manner. 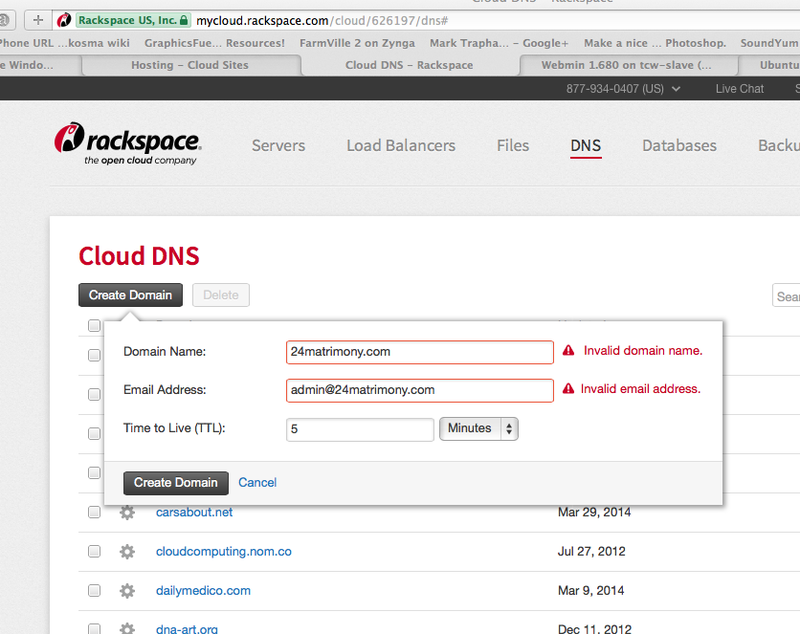 If you delete a website from Rackspace Cloud Sites Control Panel, it automatically deletes the Cloud DNS too. That is great. But, the bug or whatever I do not know; it happened with me ==> if you think to delete the website from Rackspace Cloud Sites and later add the DNS record via Cloud DNS, you will do a big mistake. Cloud DNS will not allow to add the domain for several weeks. You will feel like in a jail. I believe, this is issue of Rackspace Cloud Sites itself not of Cloud DNS as I wrongly deleted one website a year back and it took a lot of time to allow me to it add again! We will follow the same method we described in our guide How to Make DNS Propagation Faster and Save From DNS Hijacking. Using any Third Party DNS service will escape you from this situation. There is probably cached data of DNS on the same Network that basically creates the issue. DNS Setup is not easy to the most. If you are using Rackspace Cloud Sites Domain service (Click and Name), save all the credentials before, migrate the Email and then run trial with dummy subdomain first. This Article Has Been Shared 3545 Times! Big Data in the Cloud explain what is the relationship between these two new information technologies which is necessary to approach to the extensive network. mod_pagespeed and Google PageSpeed Service has been evaluated and from our tests some parts of mod_pagespeed is good but Google PageSpeed Service lags far away. Criteria for ERP SaaS Applications should fit regardless of the chosen deployment model like on-premise, SaaS or hybrid, an ERP system should be functional. Cite this article as: Abhishek Ghosh, "DNS Setup for Rackspace Cloud Sites to Cloud Server Migration," in The Customize Windows, March 29, 2014, April 23, 2019, https://thecustomizewindows.com/2014/03/dns-setup-rackspace-cloud-sites-cloud-server-migration/.